Celia (middle back in the purple top), seen here sorting potatoes with other volunteers in the farmyard, worked her last day on the farm yesterday and is heading to her next wwoof farm tomorrow - thank you Celia for your help over the past few weeks, and good luck in your onward volunteering. Small £6 veg box - Maris Peer new potatoes, red Russian kale, beetroot,tomatoes, courgettes, and runner beans. Standard £10 veg box - Maris Peer new potatoes, fresh basil, French beans, beetroot, peppers, runner beans, red Russian kale, courgettes, and salad leaves. Many thanks to Olivia, from Germany, for volunteering on the farm for two weeks, and good luck in your onward travels! Photographed today in one of our outbuildings. Small (£6) veg box - new potatoes, peppers, courgettes, rainbow chard, runner beans, and salad leaves. The standard (£10) box also contained bulb fennel, red Russian kale, parsley, tomatoes and a cucumber (but no salad this week). Franziska, from Germany, first volunteered with us in autumn 2013, and came back for more this summer. Thank you for your help and hard work, and enjoy your time up in Scotland! Darel and Rosella, from Rome, left for London today after wwoofing with us for almost 2 weeks. We'd like to take this opportunity to thank them for their hard work on the farm and in the house, especially bringing in the hay (see last entry), transplanting leeks, and making tiramisu! We cut our hay on Monday 8th August, baled it on the Friday, and brought it into the barn on the Saturday. The hay being baled, as seen from our camping field. This year we cut Carn Field and Top Field at the top of the farm, the first time we have cut these fields for our own hay, althoug they have always previously been cut for silage. Carn Field yielded 238 bales, and Top Field 100. Six years ago, when the community first began farming here, Carn field was known as Dock Field for then-obvious reasons, but six years of traditional summer cutting have minimised this old problem. Hay bales awaiting collection in Carn Field. Loading hay into the trailer - Darel, Arron and Rosella. The 2016 Hay Crew - Hugh, Arron, Olivia, Darel and Rosella. Our hay is now all stacked in the open barn, and will soon go on sale. Many thanks to the volunteers who helped to bring it in from the fields! Small (£6) veg box - cabbage, potatoes, chard, crystal lemon cucumber, courgettes, tomatoes, and chillies. Standard (£10) veg box - potatoes, cabbage, tomatoes, basil, courgettes, chillies, peppers, crystal lemon cucumber, chard, and salad. Email us on vegbox.bcf@bcents.org.uk to order your veg box. Many thanks to Felix and Emil, who left us last Friday to return home to Germany, after volunteering with us for two weeks. This photo was taken last summer (we can tell it's a Friday morning as someone is digging up new potatoes and others are harvesting salad, as well as by who is parked in the yard), and shows our market garden in good detail, as well as the chicken sheds, and the cob roundhouse under construction. 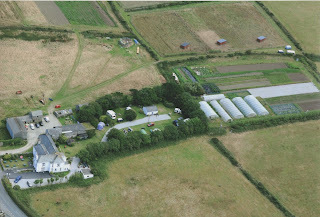 The large white house is our neighbours Bosavern House B&B, and that's their campsite too, but all the rest of the land is part of the community farm. A little slice of history! The unripe tops of some of the varieties shown above are due to (would you believe it?) excess sunshine and heat in our polytunnels, which blocks the production of the ripening pigment. The tomatoes can still be eaten, but have a slightly unripe shoulder area. This seems to affect red tomatoes more than other colours, and in particular the Stupice. Small (£6) veg box - Maris Peer new potatoes, tomato selection, mixed salad leaves, green curly kale, fresh basil, and mixed beetroot (both red and golden). The standard (£10) veg box also contained a cucumber, extra potatoes, rhubarb, and rainbow chard (but no basil). Pierre, from France, volunteered as a wwoofer on the farm for three and a half weeks, and left on Friday to head back home. We'd like to thank Pierre for his contribution to the farm during his stay, and we wish him well for the future. Pierre picking cucumbers in one of our polytunnels. On Saturday 30th July we created a wildlife and bee-dipping pond in our Bee Education Area, as part of the Grow Wild project in association with Kew Gardens. The workshop was led by Ian Willsdon, one of our volunteer board members, and attended by several local people, as well as Richard from Kew Gardens. Measuring out and digging the pond. Working alongside our awesome bee mural. Enjoying a communal lunch in the farmyard. We also created a mini cottage-garden adjacent to the pond, and continued with some groundworks of the bee project area. Many thanks to Ian for leading this workshop, to Jill for providing lunch, and to Teesh, Sonia, Karl, Penny, Pierre, Kate, Arron, Julia and Jake for attending. Tuesday 26th July was our latest "planting Tuesday", when we dedicate the whole day to getting crops into the ground. This time it was our latest batch of brassicas, and we planted all the purple sprouting broccoli, white sprouting broccoli, black Tuscan kale, and red Russian kale to see us through the winter. It's always sad when we have a good team of wwoofers volunteering on the farm, who get along and work well together, and get lots of things done in the house and out in the fields, but then several of them come to the end of their stay and move on at the same time. This has just happened to us, with Romain leaving on Friday after 5 weeks, Jackie on Saturday after 4 weeks, and Hannah on Sunday after 2 weeks, all of whom take our thanks and best wishes with them. Romain, Hannah and Jackie in the farmhouse kitchen. There are still two wwoofers on the farm, Franziska and Pierre, with more arriving this week, so a new team will emerge to see us through August. Small £6 box - Maris Peer new potatoes, fresh garden peas OR rainbow chard, a cucumber, a pointed (sweetheart) cabbage, mixed tomatoes, and mixed salad leaves. Standard £10 box - Maris Peer new potatoes, broad beans, fresh basil, two peppers, a cucumber, rainbow chard, a pointed cabbage, mixed tomatoes, and mixed salad leaves.